Enel S.p.A. is an Italian electric utility company, the second-largest in Europe by market capitalization. Formerly a state-owned monopoly, it is now partially privatized with Italian government control: the largest shareholder is the Italian Ministry of Economy & Finance (31.244%). 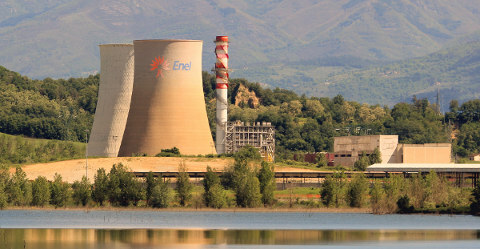 The current big concern of the Enel Generation and Energy Management (GEM) division invested plan is to improve plant efficiency and reduce environmental impact. To reach these objectives, a program was started to convert the existing oil-fuelled power plants to gas-fueled combined-cycle plants. The combined-cycle power plant (CCPP) at Santa Barbara was converted and operated in 2007. This CCPP is capable to generate 400MW electricity and it covers the peak demand of electricity within the national grid. The CCPP consists of one gas turbine STG5-400F(V94.3A) from Siemens, one heat recovery steam generator (HRSG) from Ansaldo Caldaie, and steam turbine from Ansaldo Energia. 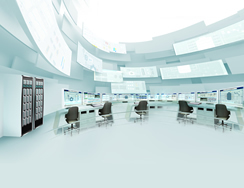 Yokogawa successfully installed CENTUM CS3000 production control system (PCS) to manage nearly 6000 I/Os and 10,000 I/Os from 25 sub-systems through OPC interface. And Enel GEM challenges field digital technology for their predictive maintenance in their asset management system. 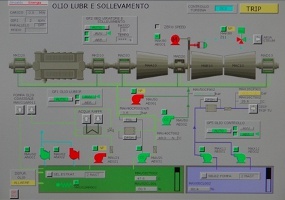 This 400MW CCPP is controlled by the integration system of CENTUM CS3000 production control system (PCS) and 25 sub-systems such as gas turbine control system, steam turbine control system, emission monitoring system, safety instrumented system (SIS) for emergency shut down (ESD) and fire and gas (F&G) system, and so on through OPC interface. 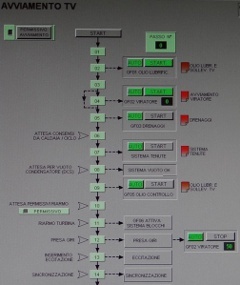 The many key procedures of this CCPP are preconfigured in the CENTUM system by using both sequence functions and PID control functions with calculation block functions, associated with graphic displays, so the operators can smoothly start-up whole process with minimum time. 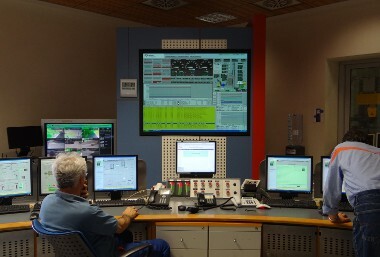 When this Santa Barbara CCPP receives the demand pattern from ENEL headquarters, the operator can flawlessly supply the demand electricity to the national grid. Regarding the environmental impact, operators are aware of the importance of the pollution limits. If the plant exceeds the limits, they take immediate countermeasures. The most important limits are about CO average hourly concentration (max. 30 mg/m3) and NOx average hourly concentration (max. 50 mg/m3). 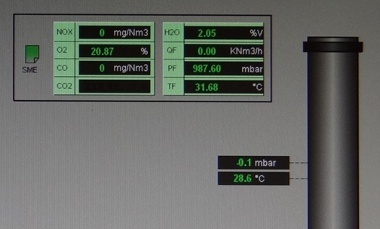 There are also limits on pH, temperature and chlorine concentration of wastewater. Seamless integration is contributing to improve CCPP efficient operation. 6000 I/Os are wired to PCS cabinets and another 10,000 I/Os are connected to sub-systems. It is very tough works for the field operators to check all field devices such as pressure transmitters, flowmeters, level gauges, many kind of control valves, and so on within the limited working time. Once a failure of field devices and shut down the plant, significant loss will be happened. To reduce the field operator work load and to reduce the maintenance fee are mandatory issue in this CCPP. ENEL GEM has to continuously run the CCPP, within the requirement is received. ENEL GEM decided to use field digital technology, applying FOUNDATION™ fieldbus and Profibus. And asset management system, plant resource management (PRM) package was included in this project. Through PRM package, the engineers and the operators can see the status and parameters for each device from the engineering work room through a engineering work station quickly and clearly. So the maintenance member can fix a problem before the complete equipment failures. This reduces the field operator work load drastically and ENEL GEM can reduce total cost of ownership. Maintenance information immediately notifies the right people, field operator and/or maintenance engineer, depending on the type and criticality of the diagnostic data analysis. The device navigation displays the status of plant-wide assets with a Windows Explorer- like interface. Flexible navigation mechanism enable maintenance personnel to quickly identify areas of the plant that require online diagnosis. 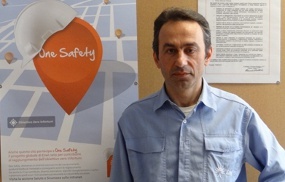 Fabio Parigi, automation manager said, "Recent DCS and field instruments are smarter and intelligent because of applying microprocessor technology. So we are always challenging to a new technology to improve our operation and productivity. For this CCPP, we decided to use field digital technology such as FOUNDATION™ fieldbus for field devices and Profibus for motor control. We are challenging predictive maintenance to monitor many field transmitter data through PRM. This will allow us to reduce the maintenance cost through the plant life cycle operation." 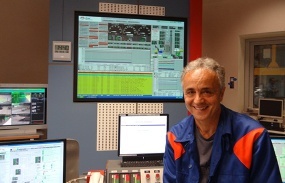 Marco Righeschi, chief operator said, "Our CCPP covers the peak load electricity, so the plant starts working whenever we receive the instruction from ENEL headquarters. We can flawlessly start the CCPP up and generates the electricity in accordance with the required demand curve. We appreciate Yokogawa's reliable system and instrumentation. We are operating this CCPP safely and efficiently at any time."